Kills two things for 7 mana, no questions asked. The only epic I'd value higher in Arena is Call of the Wild, and even then it's close! As for Ranked it's certainly not terrible, but obviously a control-only card. If opponent has 1 minion, this card can not be played? Multi-Shot works like that id assume this will follow the same rules. Multi-Shot Kappa Just kill the 2 in the middle and pay less mana. 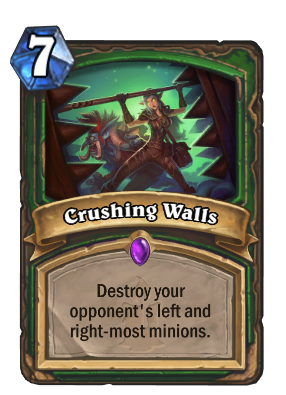 Unless blizzard decides to rework hunter hero power cards like these are just offenders to any1 with a brain large enough to know that dealing 2 dmg to opponents face has nothing to do with control gameplay. Yet another clunky, high cost hunter card for the mythical control hunter deck. The other hunter cards in this set better be healing and card draw or this will see as much play as Abominable Bowman. I guess because Meteor is guaranteed to kill at least one minion, this card will kill two. Explosive Shot cost 1 mana less than Meteor,1 mana = -12 damage. They just want to hug you, it's not their fault they're covered in spikes.